BARRY PALSER’S SUPER SIX were all here at our Farnborough Jazz Club on Friday, 27th February 2015! Trombonist Barry Palser seen here (with his own band) at Farnborough Jazz Club, Kent 27th February 2015. Photo by Mike Witt. 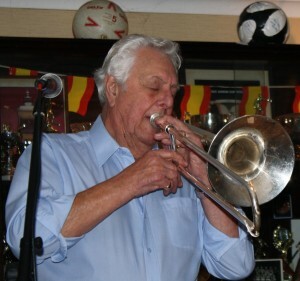 BARRY (trombonist) booked ALLAN ‘LORD ARSENAL’ BRADLEY (trumpet), TIM HUSKISSON (reeds), TONY PITT (banjo), HARVEY WESTON (d.bass) and JOHN TYSON (drums). Unfortunately, I cannot find my notes of the evening (I can hear you – “bonehead”. Keith can think of another word, but won’t tell me!). However, here are the photos taken by Mike Witt during that evening. I shall return with the write-up when the notes show up. P.S. please go to ‘Tributes’ and ‘Leslie Baguley’. I have added a lovely email received from Sandi McMenamin B Mus of Australia. Barry Palser’s Super Six at Farnborough Jazz Club, Kent (Barry, (trombone), Allan ‘Lord Arsenal’ Bradley (trumpet), Tim Huskisson (reeds), Tony Pitt (banjo), Harvey Western, (d.bass) & John Tyson (drums) 127Feb2015. Photo by Mike Witt. Tim Huskisson plays tenor sax with Barry Palser’s Super Six at Farnborough Jazz Club on 27Feb2015. Photo by Mike Witt. 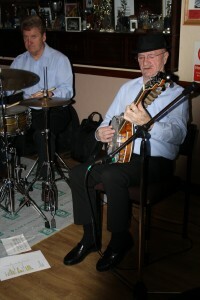 Tony Pitt (banjo) and John Tyson (drums), two of Barry Palser’s Super Six at Farnborough Jazz Club on 27 February 2015. Photo by Mike Witt. 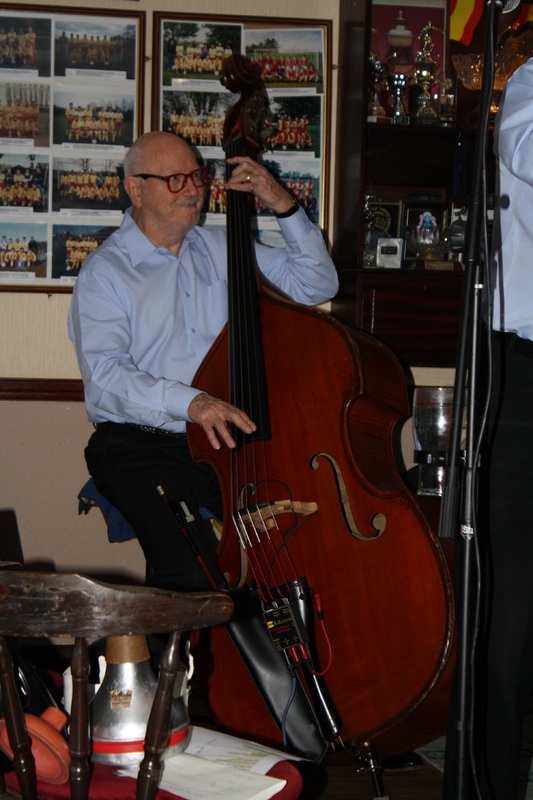 Harvey Western (d.bass), one of Barry Palser’s Super Six at Farnborough Jazz Club, Kent 27Feb2015. Photo by Mike Witt. 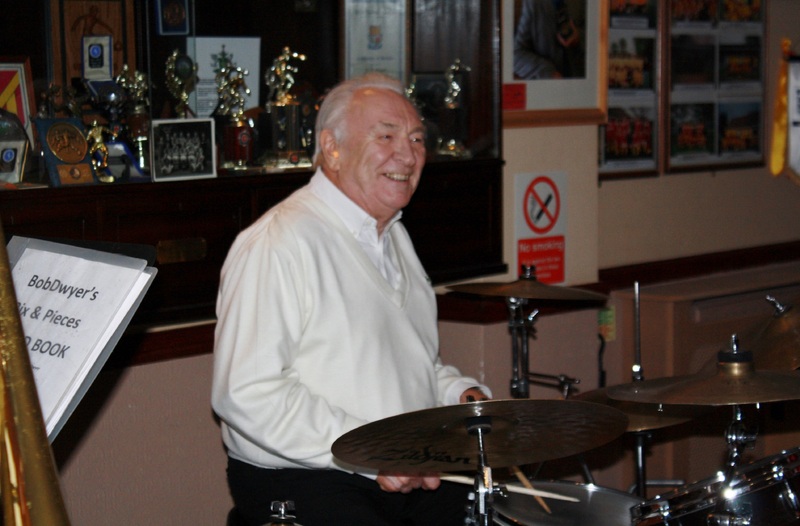 John Tyson, drummer with Barry Palser’s Super Six at Farnborough Jazz Club, Kent , 27feb2015. Photo by Mike Witt. This entry was posted in Barry Palser's Super Six on February 28, 2015 by Diane. 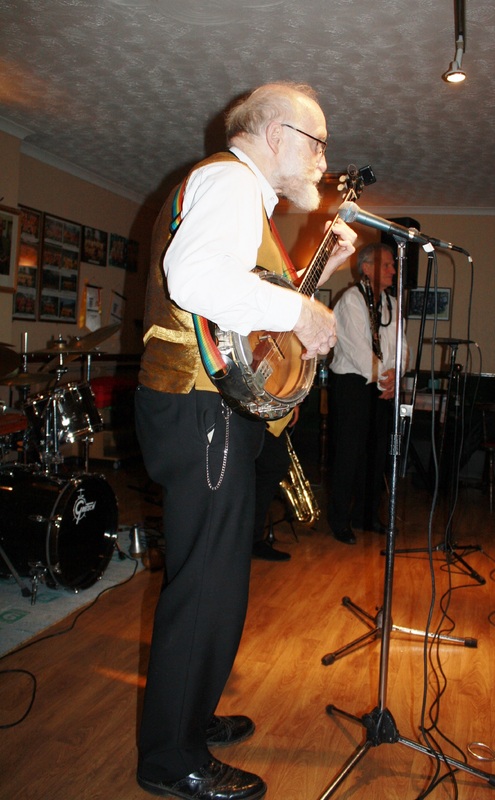 KEVIN SCOTT (tenor banjo), leader of the GOLDEN EAGLE JAZZ BAND, had MIKE SCROXTON on trumpet, ALAN CRESSWELL on clarinet, ROY STOKES on trombone & vocals, MIKE BROAD on double bass and PETE JACKMAN on drums. 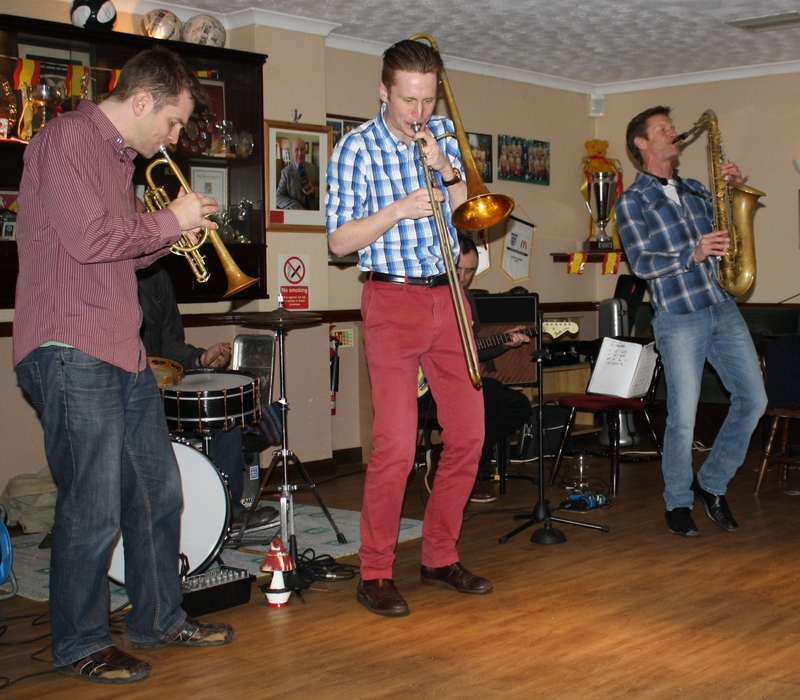 These Golden boys played their socks off for us on Friday, 20th February 2015 at Farnborough Jazz Club. They are always happy and that is before they even start playing their happy music and they were certainly on form again this particular evening. First of all I must apologise, as I shall have to delay producing this newsletter (and the next one for Barry Palser) as I have mislaid my notes. Plus we have no photos for this week. This is due to Mike Witt being absent from the club this week. The reason being congratulations are in order for Ann and Mike (especially from me). It was their 50th Wedding Anniversary and they were out celebrating elsewhere. Yes, it’s alright, they sent absentee notes from both their Mums. I shall return to complete. Please keep music ‘live’, by giving support. This entry was posted in Golden Eagle Jazz Band on February 25, 2015 by Diane. 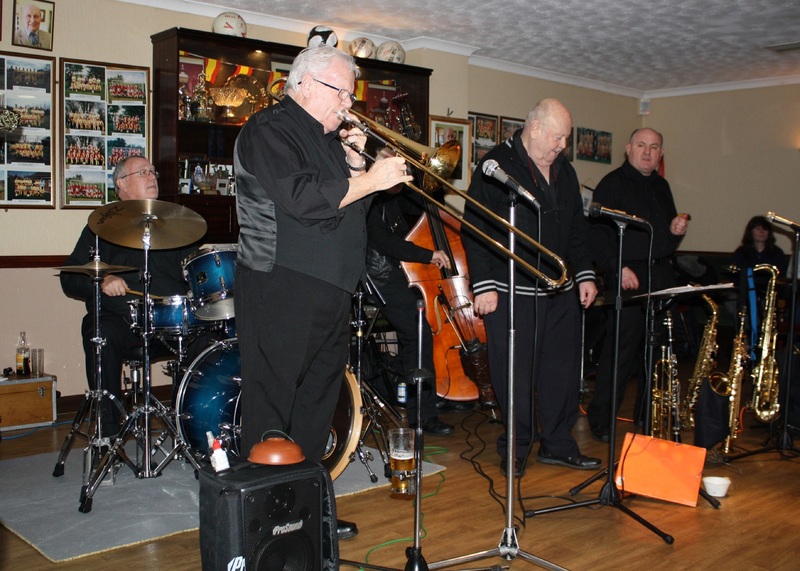 MIKE BARRY’S XXL BAND was here at Farnborough Jazz Club on Friday 13th February 2015. 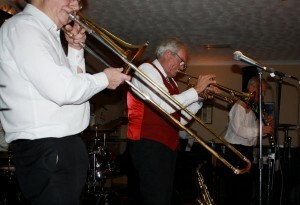 Leader MIKE BARRY (trumpeter) had booked JOHN ELLMER (clarinet), REX ODELL (trombone), JOHN STUART (banjo), TREFOR ‘FINGERS’ WILLIAMS (bass) and PAUL BUDD (drums). I told you it would be a super band and with Mike full of smiles, we were sure once again it was going to be a happy evening and of course, it was. 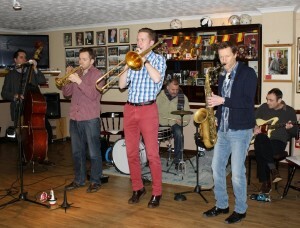 Mike Barry’s XXL Jazz Band with Mike (trmp), Rex Odell (trmb) John Ellmer (sop.sax), John Stuart (bnjo), Trefor ‘Fingers’ Williams (d. bass) & Paul Budd (drums) at Farnborough Jazz Club, 13th Feb2015. Photo by Mike Witt. So here we go again. Are you ready to hear about my usual Friday bumph. I’m not sure it was their first number, but certainly mine to mention, ‘Johnson Rag’ that is. Some of you may remember I wrote to composer Jack Lawrence, just too late as he had only just passed away a year earlier, aged 98. What a great composer. This one of his was such a jolly piece and set the evening up for me. Then Rex sang the next number, ‘Everybody Loves My Baby’ and what a wonderful asset he is to this happy band. He and Mike sang in harmony together, same as they did to the following tune ‘I Wannah Say Hello’ – terrifically. ‘Jo Avery’s Piece’ was our choice to perform our (Charleston style) line-dance. 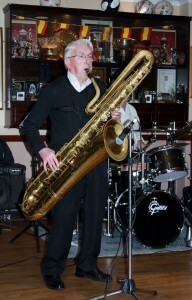 John Ellmer on tenor sax & Trefor ‘Fingers’ Williams on d. bass with Mike Barry’s XXL Jazz Band at Farnborough Jazz Club, 13th February 2015. Photo by Mike Witt. 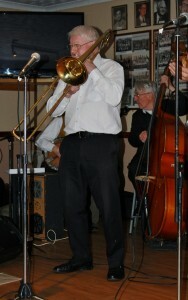 John Ellmer played brilliant alto sax with ‘Creole Love Song’, [what a talent he is – being one super drummer too]. Then that oldie followed, ‘Put another Nickel in, In the Nickel Odeon’ also sung by the duo (Mike and Rex). That tune takes me back to when we would sing along at Saturday morning pictures as a little girl – ha. They also played that wonderful tune ‘When the Midnight Choo Leaves for Alabam’ (my sister and I would perform this in shows for all the kids in our neighbourhood – poor things!). Anyway, we did another line dance to that one. One of Bing Crosby’s hits ‘We’re Poor Little Lambs – Ba, Ba, Ba’ came next. Yes, you can guess, we all had a sing-song to this one. It was originally produced by Yale University in 1910. John Stuart (banjo) with Mike Barry’s XXL Jazz Band at Farnborough Jazz Club, 13Feb2015. Photo by Mike Witt. 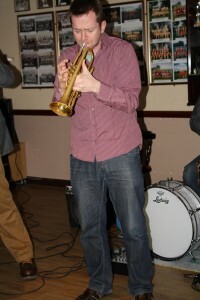 My last number to mention was Louis Armstrong’s hit song ‘When The Saints Go Marching In’. This being a rally lively one, finished with huge smiles all round and I don’t know about you, but to see a lot of smiling faces makes me feel a million dollars. 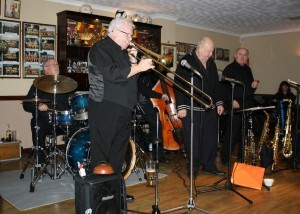 Everyone in the band gave their all and were superb, what a great evening. I knew you would leave refreshed and a little lighter (from dancing) ready to face another week. ‘Live’ jazz – you just can’t beat it! ‘The Wiffenproof `Song We’re Poor Little Lambs, Ba Ba Ba’ [Kipling’s poem] (m) Guy Scull. This entry was posted in Mike Barry’s XXL Band on February 19, 2015 by Diane. Emile Martyn drummer) of Martyn Brothers at Farnborough Jazz Club, Kent 6Feb2015. Photo by Mike Witt. The Marvelous ‘MARTYN BROTHERS JAZZ BAND’ were here again at the Farnborough Jazz Club on Friday, 6th February 2015. This very talented group of young musicians, are co-led by brothers, Emile and Ben (sons of band leader, Barry Martyn, who now lives in New Orleans). 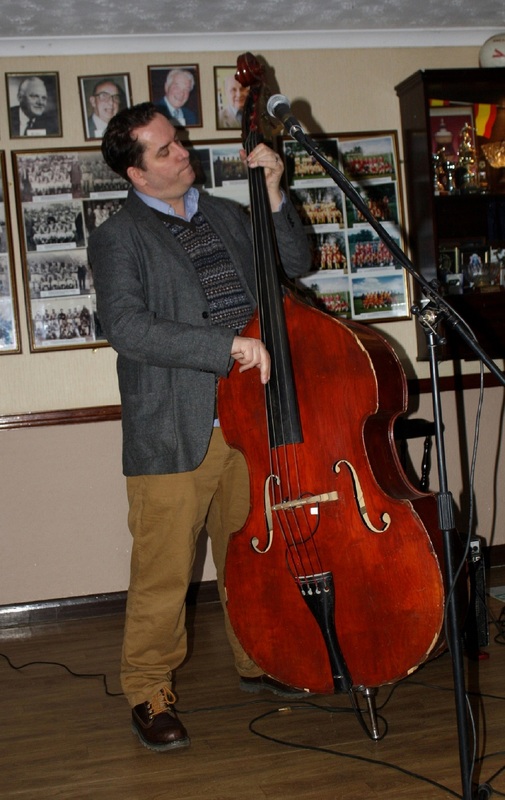 BEN MARTYN (double bass &vocals) and EMILE MARTYN (drums) were joined by ALLEN BEECHEY (trumpet), JULIAN WEBSTER GREAVES (sax, harmonica &vocals), GEORGE SIMMONS (trombone), JOHN ‘flashback radio’ RUSCOE (guitar). Martyn Bothers play Hot Jazz at at Farnborough Jazz Club, 6th February 2015. With Ben Martyn (d bass &vocs) Emile Martyn (drums), Allen Beechey (trumpet), George Simmons (trombone), Julian Webstr Greaves (sax) & John Ruscoe (guitar). Photo by Mike Witt. I just love this band and knew they would entertain you all big time. I did say it’ll be a ‘live music wow’ and I wasn’t wrong. They play a super variety of music and make it very difficult for me to choose to tell you what they played! Although not their first tune, Julian was brilliant singing and playing harmonica to ‘I Hear My Train A Comin’, with great solos from everyone, especially John on guitar. The audience just loved it. 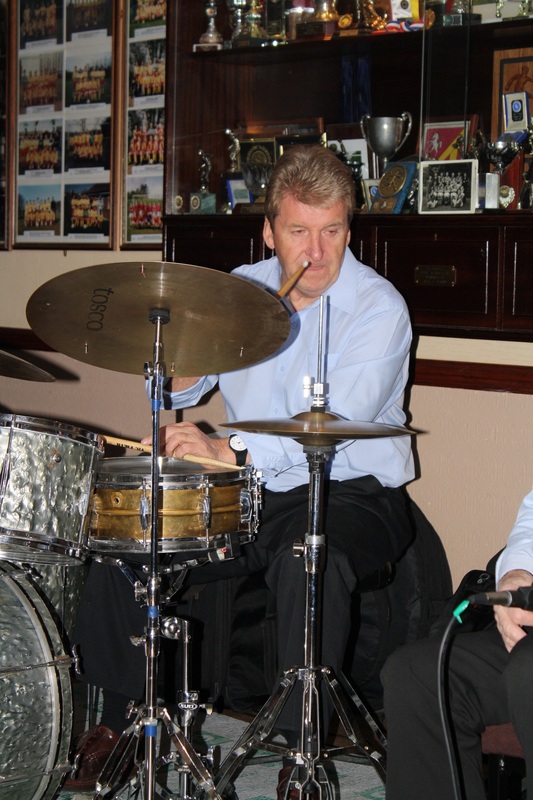 JOHN ‘flashback radio’ RUSCOE with Martyn Brothers at Farnborough Jazz Club, Kent 6th February 2015. Photo by Mike Witt. Martyn Brothers’ front line Allen Beechey (trumpet), George Simmons (trombone) & Julian Webster Greaves (sax) @ Farnborough Jazz Club, Kent on 6th February 2015. Photo by Mike Witt. Next came Ben singing ‘Walk Right In’ and rest of front line joined in singing. 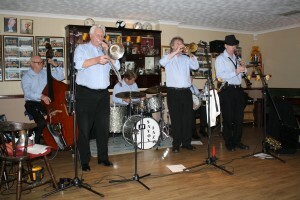 I must also mention ‘St Louis Blues’, they were all fabulous and certainly there was plenty of dancing. Young George took a turn with singing and chose ‘I’ll Be Glad When You’re Dead You Rascal You’. Well done George, you were great. Then Julian continued with his feature tune, which was ‘Hoots Mon’ and what a hoot. 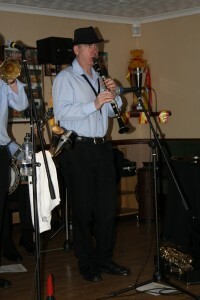 What can one say about Julian, he is just so special and plays sax a dream and have just one word for him – exceptional. Now to follow that with Allen’s special – his own composition, ‘Allen’s Blues’. I had put an asterisk by the side of my notes for this one, which means ‘a must’ to mention, being ‘wow’ (well I did mention that word at the beginning). 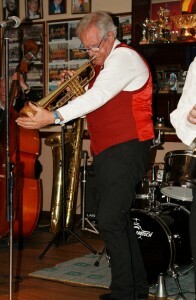 His trumpet was fabulous and he sang too. 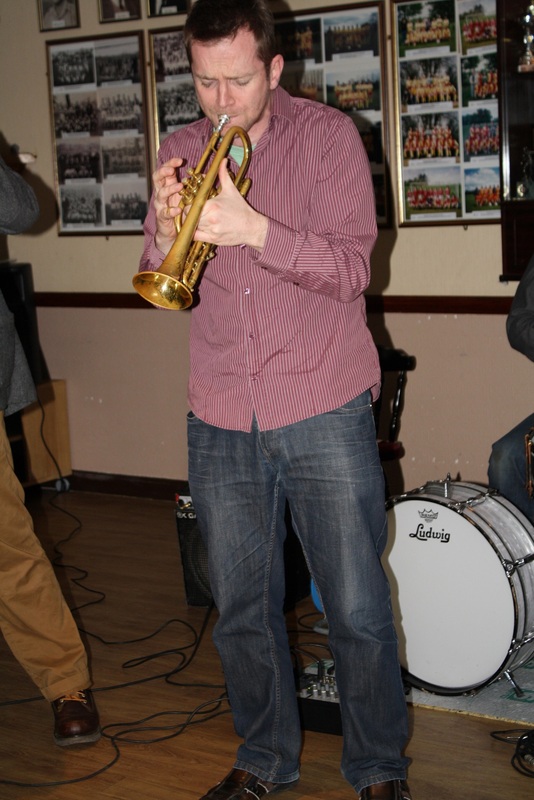 Allen Beechey (talented trumpeter) of Martyn Brothers @ Farnborough Jazz Club, Kent 6th February 2015. Photo by Mike Witt. By the way, Allen had travelled from New York TODAY, what a trooper aye? ‘Hindustan’ was next and again I have to put that word ‘fabulous’. Sorry to be repetitive, but it was! I just love the next one ‘Dancing Cheek to Cheek’ and then ‘I Scream, You Scream, We All Scream For Ice Cream’ was the number we chose to do our ‘line-dance’, think there was seven or eight of us. Ben was off to New Orleans in a few days, so chose to play his own composition ‘I’ll Watch the Moon’ (the moon being the same wherever you are on our planet). 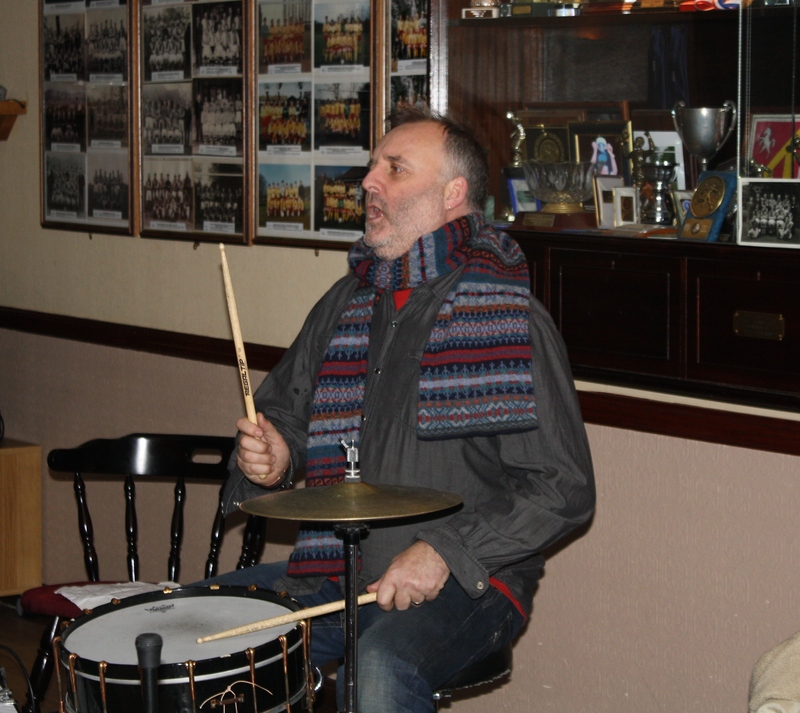 Our thanks to all in the band for a great bit of entertainment (they will return Easter’s Good Friday, 3rd April 2015 – think of all those luscious Easter Eggs in the raffle – hmmm, I’ll have to buy a ticket -ha). This entry was posted in Martyn Brothers Jazz Band on February 10, 2015 by Diane. 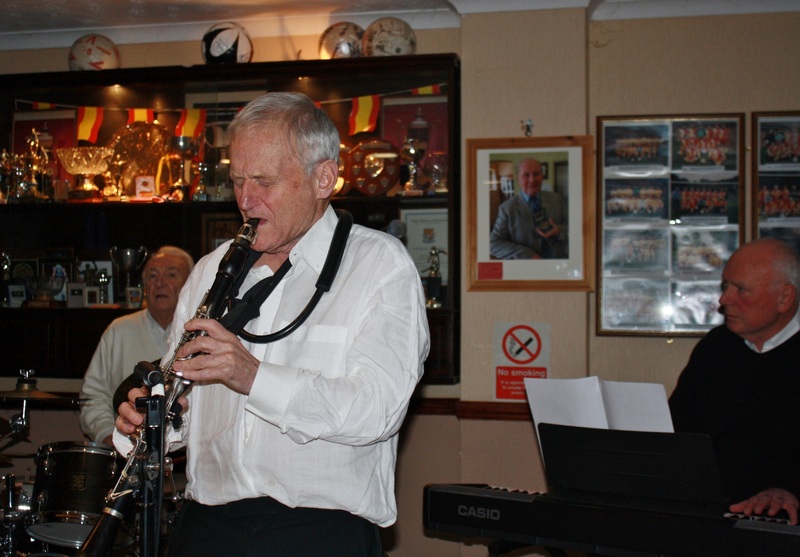 It had been ages since ‘BOB DWYER’S BIX & PIECES’ had entertaining us – at least three weeks before this evening, Friday, 30th January 2015! 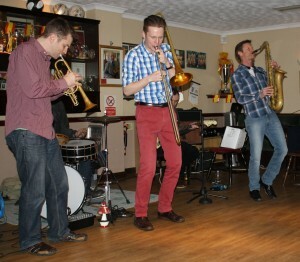 Just in case you were missing them, they returned to us here at the Farnborough Jazz Club, Kent. You might ask why? Seriously, the reason was they were kind enough to accept the date, being prepared to take a chance of last minute cancelation, should we be snowed out (as all these early bands had agreed to). So far the weather has been kind to us. I’m told they were at Hastings the night before and were given plenty of cheers. I must say I’m sure they are cheered wherever they go though, just as they are here. Leader BOB (trombone & vocals) was joined by DAVE RANCE on trumpet, BERNIE HOLDEN on clarinet & sax, HUGH CROZIER on piano & vocals, JOHN BAYNE on double bass & bass sax, NICK SINGER on banjo & vocals and drummer LAURIE CHESCOE. 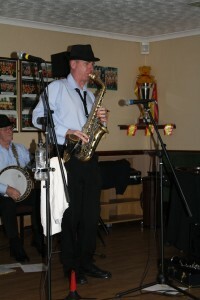 ‘Bob Dwyer’s Bix & Pieces’. 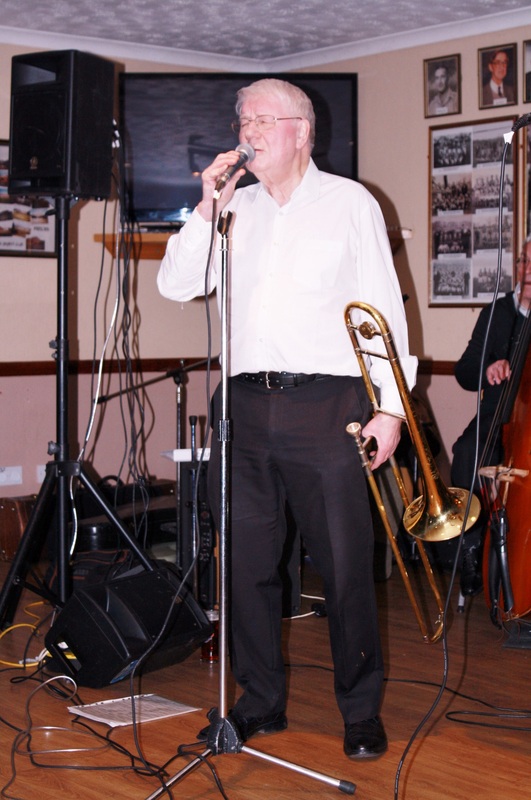 Bob (leader & trombonist) seen here at Farnborough Jazz Club 30Jan2015. Photo by Mike Witt. 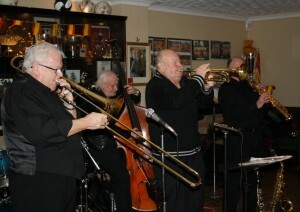 Front-line: Bob (trmb), Dave Rance (trmp) & Bernie Holden (clrn) of Bob Dwyer’s Bix & Pieces at Farnborough Jazz Club, 30jan2015. Photo by Mike Witt. Dave Rance, trumpet with Bob Dwyer’s Bix & Pieces at Farnborough Jazz Club 30jan2015. Photo by Mike Witt. Bernie Holden, clarinettist (with pianist Hugh Crozier & drummer Laurie Chescoe) in Bob Dwyer’s Bix & Pieces at Farnborough Jazz Club, 30jan2015. Photo by Mike Witt. My first note was of Hugh singing ‘Too Busy’, fabulously (although was he singing it for me? Ha!). They followed on with Bob singing a lovely number, ‘Spain’. I know I’ve said it before, but repeating it, they both have great voices. 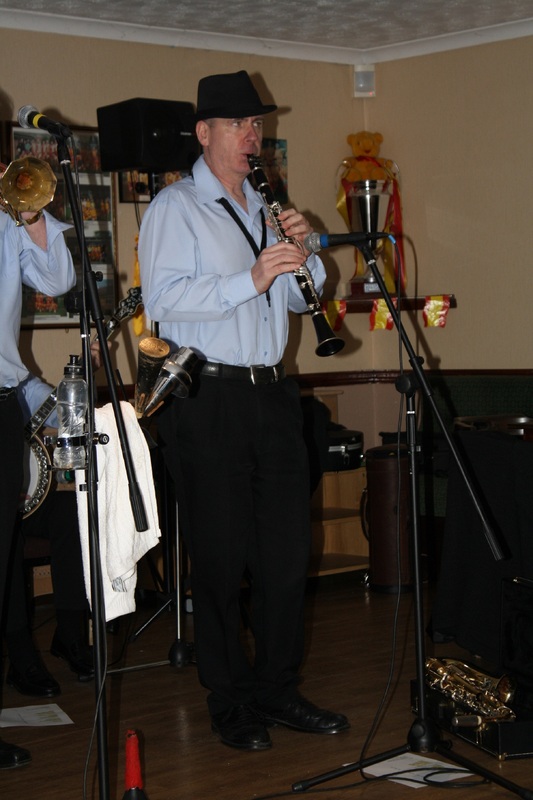 I cannot recall why I popped over to the Bob at the start of the next number, save to say I trod on his foot. He said he was just going to announce ‘Fidgety Feet’! Anyway, brilliantly played by everyone. 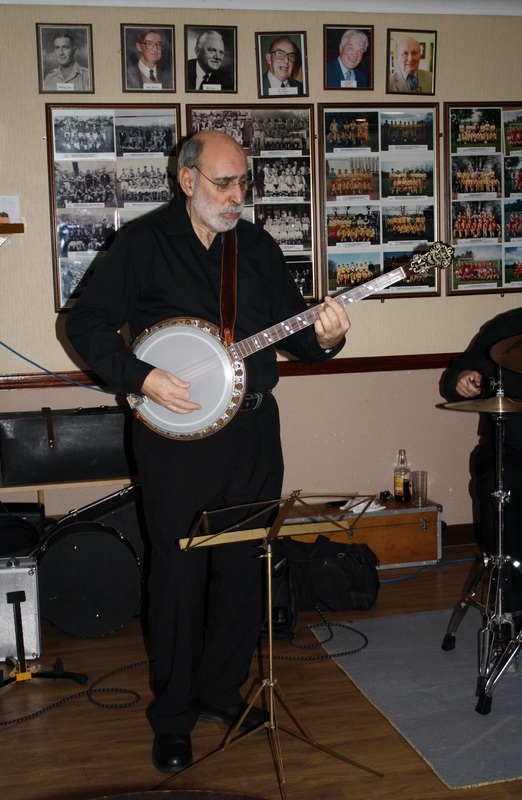 Nick Singer (banjo) with Bob Dwyer’s Bix & Pieces at Farnborough Jazz Club on 30th January 2015. Photo by Mike Witt. Then Nick came forward to sing ‘Tishomingo Blues’. Now Nick has a wonderful (dare I say gravel) voice so suited to the trad world, don’t ever stop singing Nick. Quite a contrast with Hugh’s, who sang ‘Aint Misbehaving’. 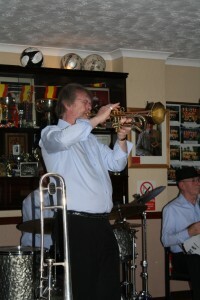 He played a super intro first, plus I noted Dave played muted trumpet with Bernie playing sax, all just great. I ticked twice and wrote ‘Fab’ next to ‘Magnolia’s Wedding Day’, I was obviously dancing, so no other comment. Hugh Crozier with Bob Dwyer’s Bix & Pieces at Farnborough Jazz Club on 30th January 2015. Photo by Mike Witt. 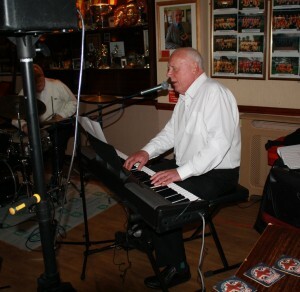 Next came a feature number for Hugh on piano and singing ‘(Oh Darling) Ain’t No Pleasing You’. 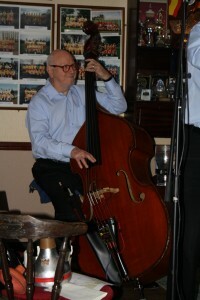 He just had the accompaniment of John on bass sax [big Bertha] and Bernie on alto sax, plus drums – abso-lutely fab-u-lous. There were so many great numbers in their repertoire, too many to mention, all with huge ticks against them too, but must mention Dave singing ‘Lilly of the Valley’, because he is another lovely singer (and of course, we were all singing along with him). 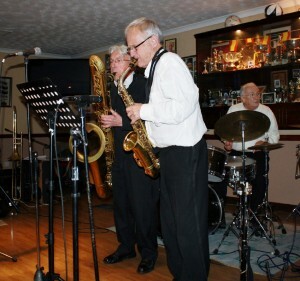 Bernie Holden (alto) & John Bayne (bass) & Laurie Chescoe on drums (accompanying Hugh Crozier’s feature) with Bob Dwyer’s Bix & Pieces at Farnborough Jazz Club, 30jan2015. Photo by Mike Witt. John Bayne plays ‘Elephant Stomp’ with the ‘Bob Dwyer’s Bix & Pieces’ at Farnborough Jazz Club, 30jan2015. Photo by Mike Witt. I must also mention our favourite number of John’s, featuring with ‘Elephant Stomp’. 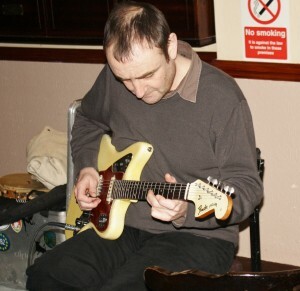 You blow our minds every time John and can never play it too often for us – so talented. I can only follow that on with ‘Puttin’ On the Ritz’, because it’s one of my favourites and we did our line-dance. Although the weather is inclement, I said last week you would soon warm up at the club, especially if you like dancing and said to get your glad rags on and turn up for some fun and join your hosts, Diane and Keith, plus our bar staff, Ian, Val, Harry, Barb and Kath too. This you did and I know you all enjoyed yourselves. Now before closing, we must pay tribute to one of our Country’s greatest leaders of all time. Namely Sir Winston Churchill, as Saturday (24th) was the 50th anniversary of his funeral. He was someone who helped to keep our freedom (thereby to enjoy our music) and who gave us great pride in this Country and United Kingdom. We both feel such pride and thanks to have been born in his era. ‘Lily of the Valley’ – hymn by William Charles Fry (1837–1882) in London for Salvation Army. This entry was posted in Bob Dwyer's Bix & Pieces on February 2, 2015 by Diane.